Artists rule the roost at Naughty Dog, which can sometimes make it rather tricky for the programmers. 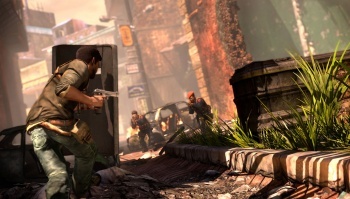 Naughty Dog's Uncharted 2 is one of the PlayStation 3's finest exclusives, and won almost universally positive reviews from all over the world. But according to Naughty Dog's co-president Christophe Balestra, just getting the game to work on the console was quite a challenge. Balestra said that three weeks before the game was due to ship, the team couldn't fit it into the console's memory. Luckily, the Naughty Dog team works well under pressure, and they were able to tweak the game until it did fit. Balestra admitted, however, that a day would come when that was simply impossible, and then Naughty Dog would have a real problem on its hands. He said that at Naughty Dog, the artists first "shot for the moon" with their designs, and then it was up to the programmers to take that ambitious, artistic vision and actually make it all work. Artists drove naughty Dog, he added, and would always go beyond the hardware resources the coders actually had. Balestra also touched on how Naughty Dog planned to improve things for Uncharted 3. Comparing the PS3's Cell processor - which has six usable processing elements controlled by a central core - to a highway, he said that where Uncharted 2 had used all six lanes at regular highway speeds, Uncharted 3 would be more like Formula One racing. He explained that if properly optimized, the processing elements could be remarkably quick, and that was vital to getting the kind of quality visuals that Naughty Dog wanted from Uncharted 3.